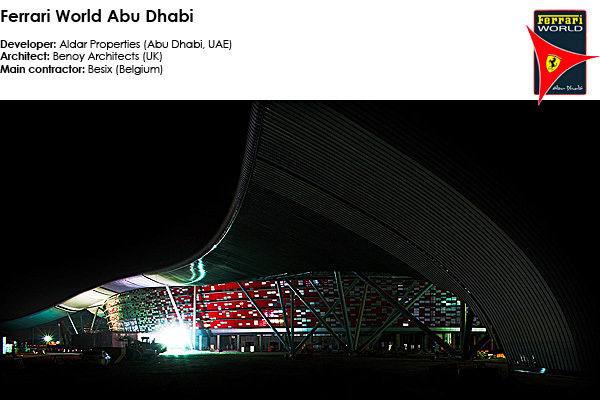 I’m very excited to have just been invited to photograph the official opening ceremony on the Ferrari World building in Abu Dhabi at the end of November 2010, for what is likely to be a lavish affair with celebrities and fireworks that can probably be seen from space. Ferrari World Abu Dhabi is part of Aldar Properties US$40billion Yas Island motorsport project, occupying a total land area of 25km2 including a Formula 1 Grand Prix track, a massive shopping mall, residential apartments, golf courses, marinas, beaches and international hotels. Ferrari World Abu Dhabi is the world’s first Ferrari theme park and largest attraction of its kind. It is an intense multi-sensory experience and a must-visit for enthusiasts, fans and families. The Park pays tribute to the passion, excellence, performance and technical innovation that Ferrari has established over the years and represents today.